During his previous conflict with Barnabas Collins, Viking wizard Morath battled the embodiment of his good side, resulting in his being thrown into a bizarre limbo, where he encounters a caterpillar-like creature playing chess with a man with white hair. The caterpillar recommends he use the Eye of Agamotto, a doorway to the dimensions which is floating overhead, to escape. Morath says that somewhere on Earth is the Orb of Agamotto, the key to those dimensions. Traveling through the eye, he emerges at the Greenwich Village dwelling of a practitioner of mystic arts, where a woman cries out, “Stephen!” “Stephen” is Doctor Stephen Strange, the Sorcerer Supreme. Strange’s Sanctum Sanctorum is in Greenwich Village. The Eye and Orb of Agamotto are both from the Doctor Strange comics. The caterpillar is Agamotto himself, who took the form of a caterpillar in the opening storyline of Strange’s second ongoing series. 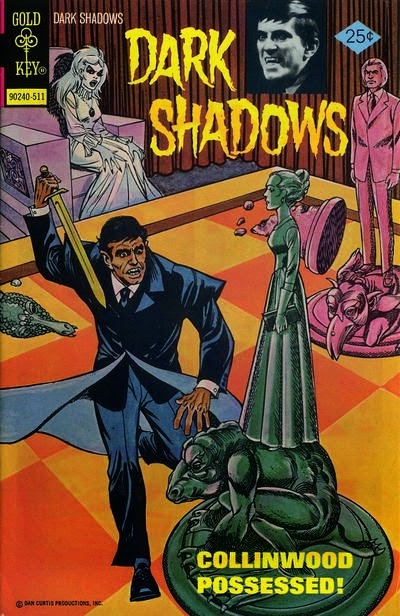 Though drawn differently than in Marvel Comics’ accounts, the white-haired man is meant to be the villainous Silver Dagger from the same storyline, while the woman is Strange’s paramour Clea.